ALMOST AS soon as we landed in New York, Beng and I ran off to one of our old haunts, the Sunday flea market on the Upper West Side. 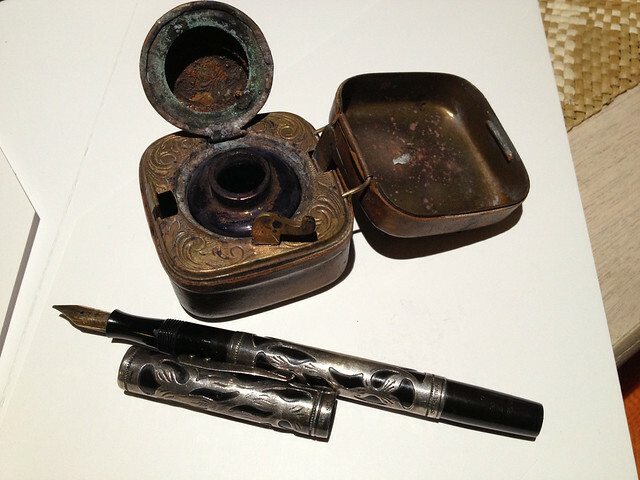 These were my two neat finds: a Waterman 412 1/2 PSF fountain pen in silver filigree from 1915 (still a bargain at $150), and a brass inkwell, in dire need of restoration but a pretty piece (at a pretty price–$10!). This entry was posted in Pens, Travel and tagged ink, pens, vintage, Waterman by penmanila. Bookmark the permalink. yes, the inkwell is great, but how is the fountain pen a bargain- please explain? i totally believe you and bow to your greater knowledge. good to know, & i wonder if any will turn up in sydney…. Hi, stumbled upon this post and saw your great looking inkwell! Was wondering if you’re selling some of them, I’m interested. hi, sorry but i have none for sale.